“Still Alice” is a very difficult film to watch not because of the subject matter but because Julianne Moore inhabits the persona of Alice so you feel, and see, everything that is happening, and what will happen, to this woman. Alice Howland is a very successful linguistic professor at Columbia University in New York who has written books on language and traveled the world teaching it. She and her equally successful husband, John (Alec Baldwin) live in a brownstone in which they have raised their three children, now on their own paths, and have a summer home on the shore. In everyway she is successful as a professional, a mother and a wife. 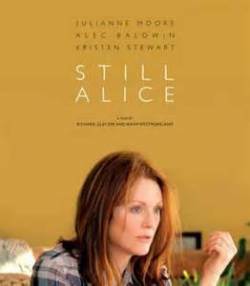 Very early in the film Alice, at the age of fifty, is diagnosed with early on set Alzheimer’s which it turns out is genetic and there is a 50 percent chance of their children contacting it and, after testing, one of the children tests positive. The screenwriters/directors Richard Glatzer and Wash Westmoreland dismiss this angle in the movie instead concentrating on Alice and Moore comes through with a devastating performance. By the end of the film you will know what it means to have Alzheimer’s, what and how it takes everything from you. Wordlessly, with a look, the changes in her face, the awareness of what she will lose before she loses it, is upsetting because we know what she had and she no longer does. The film rightfully concentrates on Moore but the screenwriters don’t help her in not filling out the roles of her husband and children. We know her husband loves her because he tells her but Baldwin is a good enough actor to show us with little touches here and there. Her children, played by Kristen Stewart, Kate Bosworth and Hunter Parrish, are normal, well adjusted children which at times can drive a parent crazy and there is one scene where Moore uses that old line, “….I can because I am your mother,” that has the audience laughing. The conflict between a mother and daughter is briefly touched on just as the sibling rivalry between sisters is but neither are fleshed out. The film is not all sadness and tears, with little bits of humor here and there, but we share the few triumphs Alice has along the way just as in two scenes we are afraid to breathe. For those who haven’t dealt with Alzheimer’s in their family this is a learning experience of what has happened with 45 million people in the world going through this debilitating disease and what their loved ones have to deal with. Julianne Moore has deservedly earned 4 Oscar nominations along the way and with her 5th in “Still Alice” she is deserving of getting that statue that has eluded her.